On October 6th, Chicago’s Wintrust Arena will host the American premiere of promoter Eddie Hearn’s Matchroom boxing. 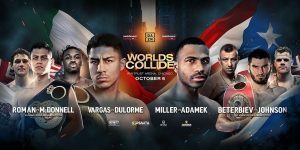 The card, which will feature welterweights Jessie Vargas and Thomas Dulorme will be broadcast live on the DANZ streaming program. “This is a huge event and the first of our 16 fights across the year on DAZN,” said Hearn during a Wednesday press conference. “We are delighted to be in Chicago, a great fight city that we hope to really invigorate on October 6 in front of a huge crowd.” DANZ which, like ESPN+, charges a small fee, is being promoted as the viewing experience of the future. No doubt a thrilling bout is something Eddie Hearn and the people of DANZ would love to broadcast.